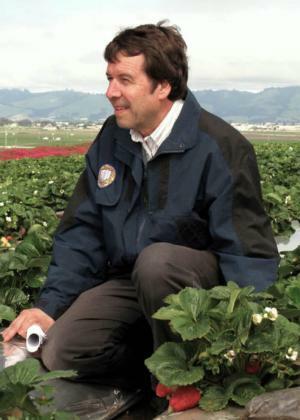 Frank Zalom is Distinguished Professor of Entomology, Agricultural Experiment Station Entomologist and Extension Specialist at UC Davis where he teaches Arthropod Pest Management and conducts IPM research on tree, vine, small fruit and vegetable crops. He did a brief Post Doc at UC Berkeley in the late 1970s, before becoming Assistant Professor at the University of Minnesota where he taught Economic Entomology and Insects in Relation to Plant Disease and conducted research on insect vectors of plant diseases. Frank returned to the University of California as Extension IPM Coordinator in 1980 at the inception of the Statewide IPM Program. He served as UCIPM’s Associate Director for Research and then as its Director for 16 years before returning to the Entomology Department in 2002. He was the Department’s Vice Chair from 2005-08. Frank provides IPM leadership nationally, and served as co-Chair of the APLU National IPM Committee from 1999-2015, IPM representative to the ESCOP Science and Technology Committee since 2003, and USDA Western Region IPM Competitive Grants Program Manager from 2004-14. He served on the USAID Board of Directors for the IPM CRSP from 2001-05. Frank is a Fellow of the California Academy of Sciences, the Entomological Society of America (ESA), the American Association for the Advancement of Science (AAAS), and the Royal Entomological Society (London). He has received a Fulbright Senior Research Scholarship (1992-93), the ESA Achievement Award in Extension (1992), the ESA Recognition Award (2002), the James H. Meyer Award from UC Davis for teaching, research and service (2004), the Entomological Foundation IPM Team Award (2008), the Entomological Foundation Excellence in IPM Award (2010), and Outstanding Mentor Award from the UC Davis Consortium for Women and Research (2013). He was 2011 recipient of the CW Woodworth Award from the Pacific Branch, its highest recognition. Frank served as ESA Pacific Branch President (2001) and as its Secretary-Treasurer (1983-89). He was elected to ESA national office as Vice President-Elect in 2012 and served as Vice President, then ESA President in 2014, presiding over the 62nd Annual Meeting in Portland, OR. He served as President of the Entomological Foundation in 2015, and continues to serve as a member of the Entomological Foundation Board of Directors and ESA's Science Policy Committee. He has authored over 335 peer reviewed journal articles, book chapters and books, including "Food, Crop Pests, and the Environment" published by APS Press, and has served as Major Professor for 12 PhD students and 7 MS students.